When it comes to fragrances, I would say that I prefer floral and musky scents best. I’ve never been a fan of sweet smelling perfumes, but I don’t mind sweet scents in the form of bath products, scrubs and moisturizers. And of course I love to eat sweet treats! I’m also a fan of clean, fresh scents especially during the summer months when the heat doesn’t really do us any favors. I have a few perfumes that I rotate between including a couple of fragrances I mentioned in a previous post. I’ve been loving the likes of Jo Malone for the past year or so and am currently enjoying alternating between four different scents: Wood Sage & Sea Salt, Blue Agava & Cacao, Blackberry & Bay and Pomegranate Noir. 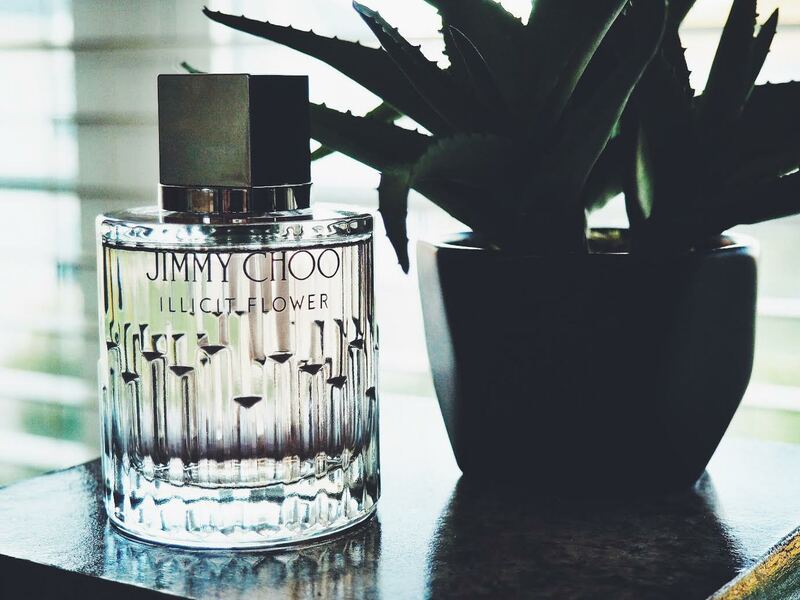 Luckily, I received Jimmy Choo Illicit Flower as a gift after coordinating an event at work. It’s become one of my favorite perfumes in my current collection as I find it to be the perfect scent for this time of year. Part of my job entails coordinating events for luxury brands like Hermès, Giorgio Armani, Tory Burch and Jimmy Choo to showcase new product launches to editors’ from different publications like Vogue, W, Allure, Glamour, GQ, etc. I work directly with the PR folks from the brands to make sure they have a conference room set up with catering, AV, decor and all that jazz. Essentially, it’s my job to make sure the day runs smoothly for all parties involved. Receiving gifts as a “thank you” for coordinating these meetings is definitely a work perk. It’s even better when the products I receive are often items I would purchase myself. And if that’s the case, I want to share these products with you whether they’re fragrances, skincare or beauty bits in the hope that you may see something you like. Alternatively, I also receive gifts that I may not completely love and therefore don’t feel the need to share here. Jimmy Choo Illicit Flower is a new 2016 launch as a follow up to the original Jimmy Choo Illicit scent that you may be familiar with. It’s both a musky and floral scent with top notes of apricot and mandarin orange. It contains middle notes of grapefruit blossom, jasmine and rose with base notes of sandalwood, cashmere wood and musk. You won’t be able to find it in your local Sephora or Ulta just yet, but it might just be on your wish list if you like what you’ve heard! Hope you’ve had a great weekend. Good day! I could have sworn I’ve been to this blog before but after going through many of the posts I realized it’s new to me.